I’ve been looking for a good replacement to Band-in-a-Box. The gold standard for automated accompaniment software is Band-in-a-Box from PG Music. 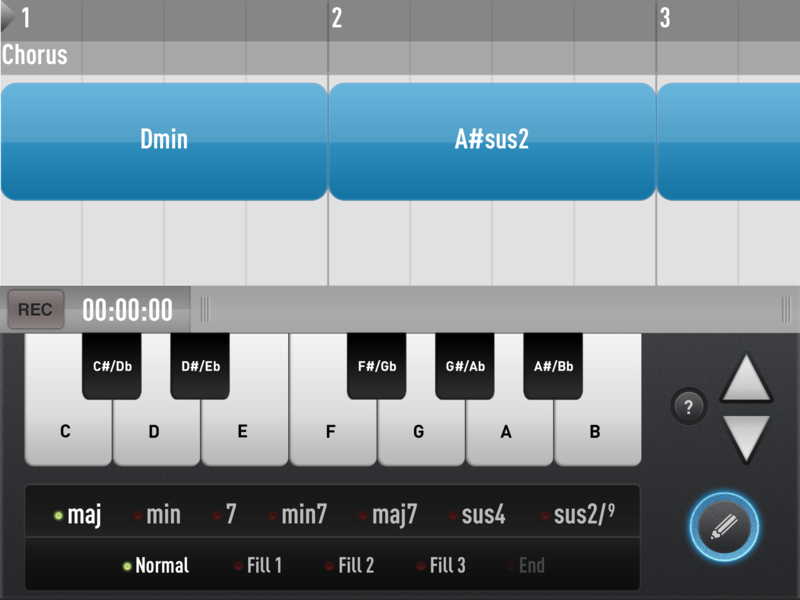 You type in the chords to your song, select the style and tempo and it plays back an accompaniment. 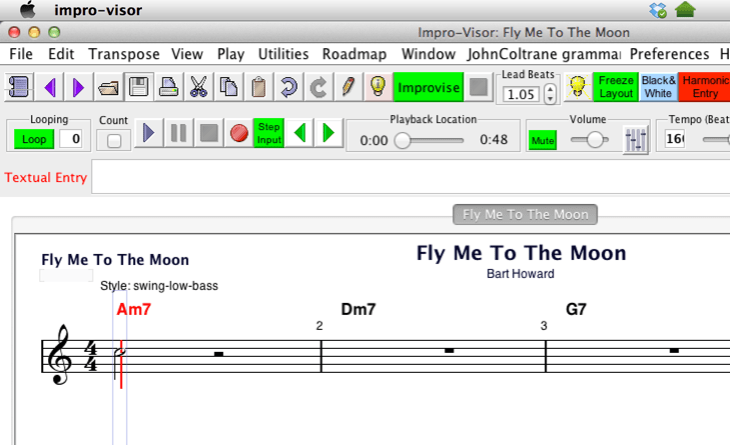 This type of software is great for song writers as wells as for musician’s who can’t always practice with a band. Among the cool features are the ability to change the style, change the key and change the speed. You can even edit the band that is playing by muting some instruments or replacing one instrument with another. The major problem with Band-in-a-Box is it is expensive. If you have the money and are serious about music, it’s worth it. I purchased a copy years ago and paid for multiple upgrades. I still have it on an Windows XP laptop. But that was a computer I used three computers ago. Ancient in computer years. I’m now on a Mac. The good news is Band-in-a-Box is available for both Macs and Windows. But if you buy extra styles it can run hundreds of dollars – money I no longer have available for software. Sell a guitar to buy Band-in-a-Box? I don’t think so! There are a number of alternatives available on different platforms with prices from free to not very much, all a lot less than Band-in-a-Box. But you get what you pay for and BIAB (as it is often known) may be worth it to you. What has me excited is a new series of iPad apps that are nearly as easy to use as BIAB and a lot less expensive. I’ll review that app last. First, some of the other alternatives for Windows or Mac laptops (or bigger computers). I’ve written about Impro-Visor before. It has some similarities to BIAB. It was written as a tool for jazz education to help students study improvisation. But it can also be used as auto-accompaniment software. The interface isn’t as intuitive as BIAB and the accompaniments generated aren’t as good. There are fewer styles to choose from and like older versions of BIAB, but unlike options for the new versions, the music generated is pure midi. The advantages of Impro-Visor are that the software is free and is available on Windows, Mac and Linux. So far, Impro-visor isn’t available on tablets. … and other Audio, Midi and Loop and Editing Software. I own a copy of Sony Acid (somewhere). But I’m really using this as an example of loop, midi and audio edition software that allows you to arrange, stretch and pitch change musical snippets as sound file loops. Sony Acid also allows you to combine midi tracks with the audio tracks. There are many cool and useful things you can do with this type of software if you are so inclined but for me, it fails as an easy solution for creating automated backing tracks. You essentially must become a sound editor to use this. Once you’ve made a track, you’re stuck regarding style unless you start over. This isn’t what I want. If this were pre-computer days I would want to either be able to call out the chord changes I wanted, or I want to write down the chords – at most a lead sheet with chords and a melody line. 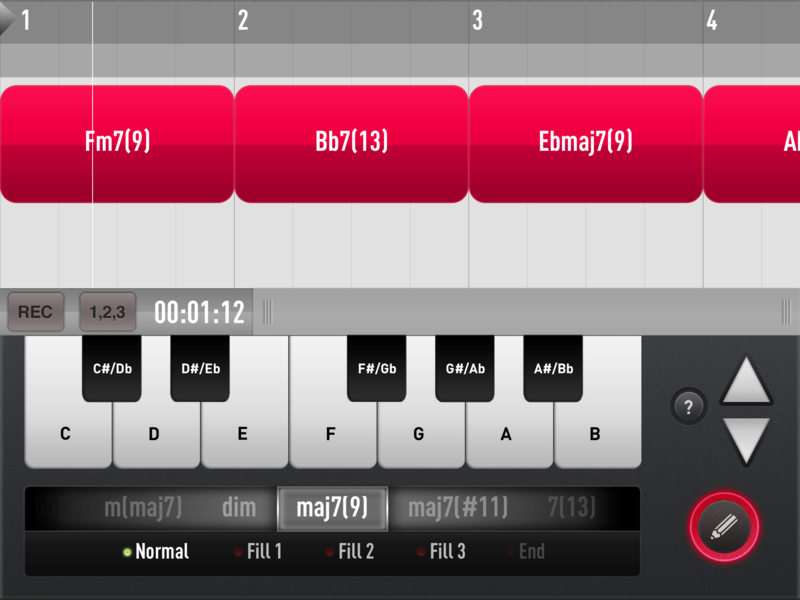 Many of the iOS and Android tools I’ve seen require you to string loops together or to “play” a virtual instrument in order to generate a backing track. That’s too much trouble. It may be fun if you’re not a musician but I don’t want to pretend I’m playing a virtual keyboard, I just want a blues progression in a shuffle rhythm – what ever. If you’re a Windows user, you’re out of luck with this Apple product. 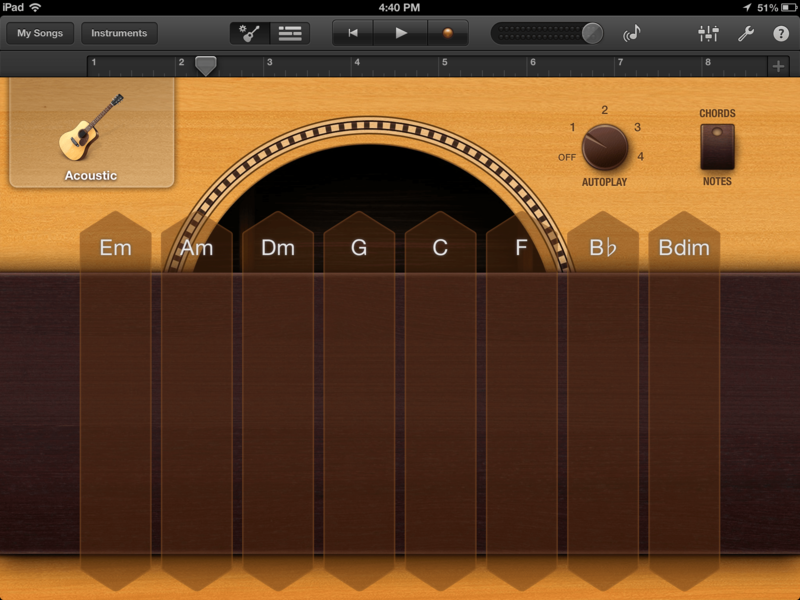 Garage Band is reasonably priced and has a lot of features. Among them, you can create backing tracks fairly easily. However, if you want automation then this product is very limited. There are only a small selection of instruments and styles supported and chords are limited to the harmonized scale for the key you choose. Still, if you can live with that, and can live with sort of playing the auto-accompaniment then it’s a good tool. It’s available both as an iLife app for Macs and an iOS app for your iPad or iPhone. 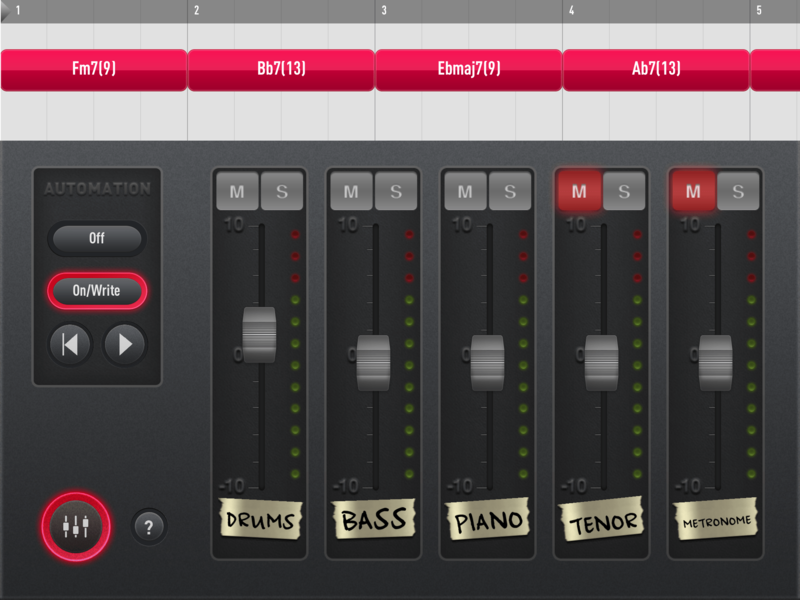 You can add tracks for drums, orchestra, keyboards and all allow you to auto play chords in several styles. Alternatively you play single notes and by choosing a scale (e.g. minor pentatonic) force only those scale notes to be played as you pluck or strum the strings or virtually pound the keyboards. But when you’re done you’ve got a multi-track sound file which is now stuck in the musical style you selected. There’s no easy going back and changing the chords or the feel of the music. I just recently discovered Session Band app for iPad. It seems to be a new product that was released in June 3013. I don’t know if the author plans to increase the price but right now it is a bargain. I purchased the Session Band app for under $3 and then did an in app purchase for all styles for just under $6. I then discovered they had separate apps for Jazz and Acoustic Guitar for $0.99 each (they also have a piano app for $0.99). The product is new and much more limited than BIAB or even Impro-Visor. But it uses professionally recorded loops that are automatically assembled into your backing track based on the chords you enter. It comes with a selection of styles which you can apply at any time to change the feel of the music created. Of course you can transpose and change the speed. To create a backing track, just choose the chord you want to enter. You can pinch the chord to shorten or lengthen the number of beats it is played. The styles are grouped by Acoustic, Blues, etc. Some of the styles in each group require an in-app purchase and download, however you can sample a demo for free before downloading. Of the 3 stand alone products, the acoustic guitar sounds the worst. But at 99¢, it’s still worth a look. 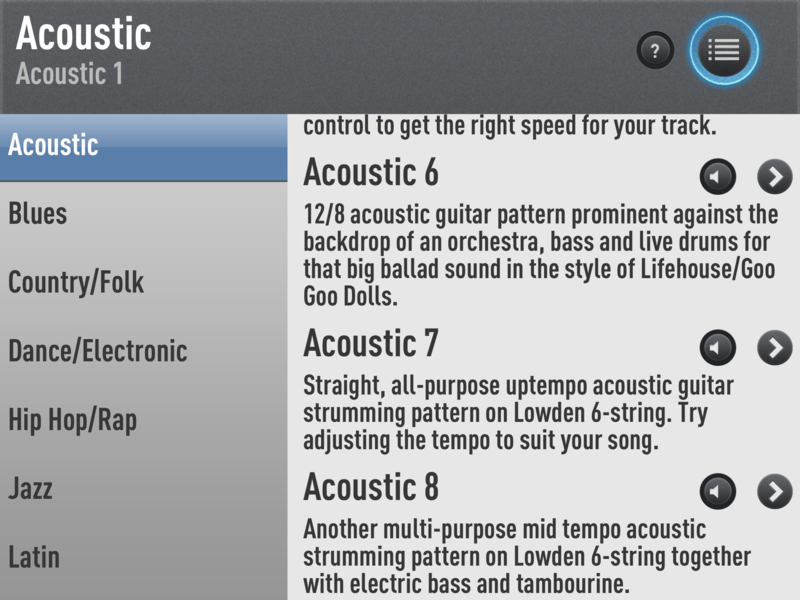 The Jazz, Piano and Acoustic Guitar apps, as dedicated stand alone products, look a bit different than the larger Session Band app. But the principles of operation are pretty much the same. The chord selection is limited to extended and altered jazz chords. All of the styles are played by a jazz quartet – drums, keyboard, bass and sax or flute. You can mute or adjust the mix of the instruments in an edit window (right image below). Session Band isn’t perfect. I wish there were more “normal” chords in the Jazz edition and more “jazz” chords in the standard edition. I wish there were more bands and styles for all the editions. And some of chord changes – particularly for the acoustic guitar edition, aren’t stitched together well and sound artificial. In spite of that, it’s a wonderful new product and the introductory price makes it a bargain. Make your own backing band playing the changes you want and have fun.